A Year's Worth of Grocery Shopping! Now I can see it! 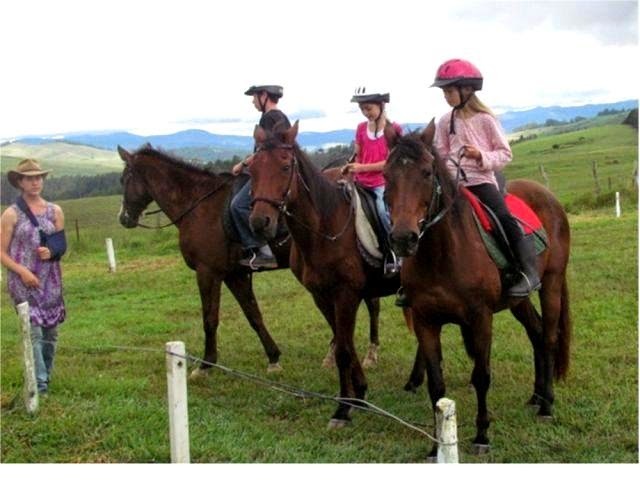 Not long after I arrived back in Papua New Guinea in April, I took up my old job of horseback riding instructor at the paddocks (you can read about those adventures here) with over 20 students from four different countries and even more languages. Experience and age ranged widely, from those first learning how to groom a horse to students schooling dressage and jumping. We have lots of fun together learning about horses...and students come away with more than just equestrian skills. 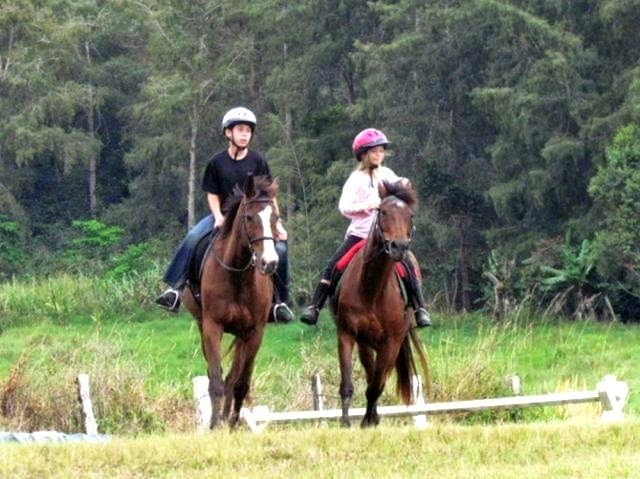 Through the Pony Club, both young people and adults learn about responsibility, teamwork, perseverance, and character development, and many of them develop lasting friendships with fellow members. It's a safe place to process emotions regarding transitions and the sorrows of missionary life (often easing the adjustment period, especially for new children struggling to adapt) and it provides an athletic outlet for those who might be regularly trapped behind a desk and who may never otherwise have a chance to play with horses :) It brings people together of all generations and walks of life, giving them the chance to praise God through their equine involvement. Playing "red light, green light" with the beginners! Earlier this year, at the conclusion of the beginner course, we held a gymkhana, or a “fun show” with classes that involved balancing full cups of water, racing around barrels, climbing over tarps, and bribing your horse to follow a carrot. It was lots of fun and a great opportunity for the youth to demonstrate what they learned. Don't spill! She's trying to balance a full cup of water while still performing all the tasks correctly! We had so much fun at the last gymkhana that we hope to hold another one this fall. There's no end to our horsen' around! 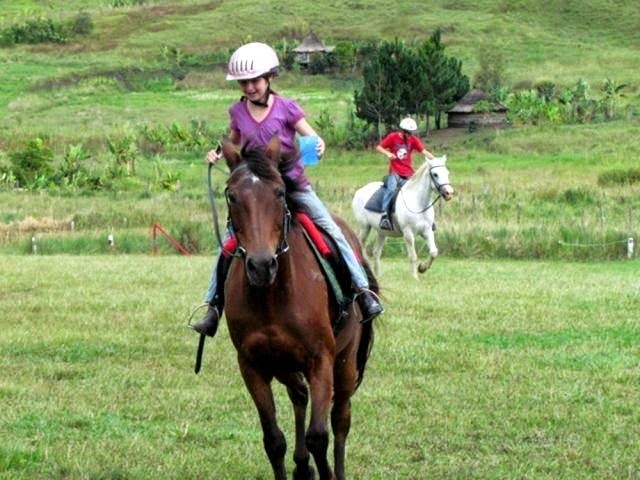 Horses have been a huge part of my life for nearly 20 years, and they continue to be one of the primary ways that I de-stress here in PNG; I'm grateful for my ability to continue to be involved with them as the main riding instructor, the trainer, and the "vet." You can read about some of that journey here and some stories from my sister here. Shopping in Papua New Guinea is always an adventure—you never know what you might find! Would you like a bag of MSG? Often there might only be one kind of item that you are looking for...but sometimes, like in this aisle of tuna, there can be more varieties than you have ever imagined! When you do see something you like, it’s important to buy as much of it as you want—because it could be months before the store would get it in stock again. Knowing exactly what you are buying can sometimes be tricky—because the food might be labelled in only one of several different languages, including English, Bahasa Indonesian, Tok Pisin, Hiri Motu, Chinese, and Thai. My friend, Hanna, tries to read some labels...and then just takes her best guess! In June, I travelled to Lae, a port city about 4 hours away, where there are more stores and variety of products than we might find in the nearby town of Kainantu. Lae even had gluten-free items, and so I attempted to buy enough supplies to last me until my next potential trip to Lae—probably next year! A year's worth of food means lots of packing into boxes before we can go home! “If you are really praying for something, and if you really want something to happen, sometimes God can put the finger on you.” Katawer grinned, remembering his journey to becoming a translator for the Arammba people. Back in the 1980s, the Arammba had begun praying daily for God to send a Bible translator to their area. One day in 1989, a missionary came and settled in Kiriwa village. “We thought, he will be the one who will be the translator in our area,” explained Katawer. But, the man wasn’t able to stay and soon left. But then, the Boevés, from the Netherlands, arrived in Katawer’s area and explained that they were there to help with Bible translation. “We were very happy!” Katawer’s eyes shone. “In 1999 he called a workshop and taught us how to go about translation.” Katawer and a team of four other translators first tackled the book of Jonah and later the book of Genesis. My friends, Michel and Erna Pauw, have recently teamed up with Katawer to help him continue to translate the Bible for his people. Julie, her spoon hovering over a pot of simmering vegetables, paused in the middle of dinner preparations and straightened. 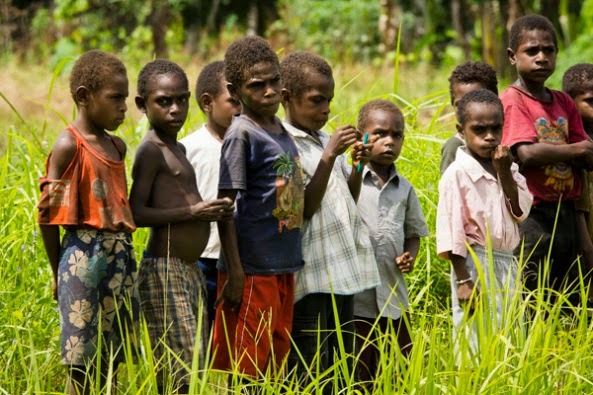 The boys’ voices carried easily from the other room, and as she listened, one of the young men avidly described his entrance into local cult worship in Milne Bay province. The other Maiwala boys prodded him to learn more, and as he shared, Julie began to pray. Lord, how can I reach these boys? Once dinner was ready, Julie invited the boys to join her. “But first, before we eat, I want to tell you a story.” And as they listened, Julie wove into life the Biblical story of the escaping Israelite nation and their downfall with the golden calf. When she finished, the room was silent, and Julie, smiling a little, merely handed the boys their bowls and bid them eat. He paused, then looked them straight in the eye, “I know that there are no other gods—just God himself. Storytelling is a powerful method of sharing God’s truth, and Julie has seen this firsthand both in her home language of Maiwala, as well as serving as a trainer of Oral Bible Storytelling throughout the nation. Julie was one of my colleagues when I was a translation adviser at one of the courses last year. She uses her gifts to teach people how to tell vivid, life-changing Biblical stories in their own languages, which often paves the way for written Bible translation. Norbert had never seen a painting like this one. It was his first visit to the Ukarumpa Meeting House and above the stage a giant painting stretched over the room. 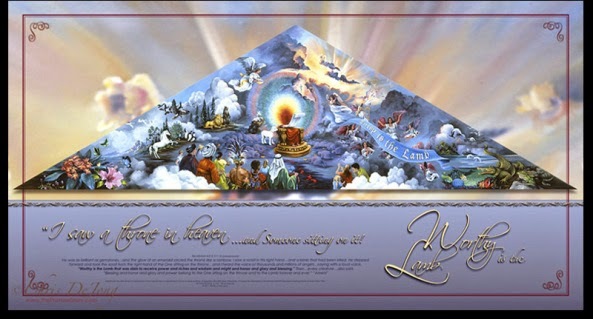 Painted by Chris DeJong in 2001, it was filled with angels and clouds and animals and people from around the world all focused on the very centre, where a Lamb stood before a scroll. It’s Revelation, he realized. “Teaching is a call for me—ever since I was a little child I’ve wanted to follow the example of Jesus Christ as a teacher.” Norbert first studied computer science in seminary and later went back to school to study education to improve his teaching skills. “I’m always studying!” he laughed. I've had lots of fun visiting with Norbert and the students in his classes. Teaching computer skills is a huge demand here in PNG, and it's exciting to be able to pair it with discipleship and Bible translation! Canoe-making in Gulf Province is not only a necessary skill for everyday transportation, but it’s also an art form, passed on from fathers to children. While I and my teammates were on a three-week survey of several languages in Gulf Province in August, we observed canoe-making in every village we visited—and some were quite prolific dugout shipbuilders! Enjoy! Thanks to a major flood only a few weeks earlier, many giant logs had been captured and floated to the villages for carving. Sometimes young men would gather dozens of logs together and float them on the tides to later sell. We saw one barge with a little sleeping shelter (and of course a dog) on top of the logs! Some take the log up the side streams, away from major currents. Here they are starting to shape the underside and sides (the cracks are patched with pieces of tin or wood). Shaping the stern! Despite using what looked like large and awkward axe, the canoe-builder was extremely precise in his cuts, and could wield that axe like a conductor’s wand. Time to hollow out the middle! In between work, the canoe is covered with branches to prevent the tropical sun from drying out the wood and causing splits. This one is almost completed. Now they add decorative carving and prepare it against termites. They build a fire under the boat using dry coconut leaves. This produces a greasy soot which coats the bottom of the boat which protects it against worms and termites. Some canoes are tiny, and might only fit one person. Others are huge and could pack 50 or more people inside! Some canoes have a flat stern, where a motor could be attached. No matter what, all canoes require outstanding balance to maneuver! Not all canoes look the same throughout Papua New Guinea. Canoes that are made for ocean travel often have outriggers--like this one that I rode on in Madang Province. 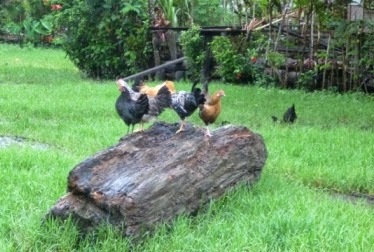 They race past the rooster, grazing his wingtips, and he squawks, hops, crows in surprise. Around the water-tank pen of crocodiles who thrash at the sudden vibration, six piglets, striped, spotted, black, white, brown, only weeks old, charge past, a frenetic dash just for the joy of it. Dodging veranda posts and barreling between the legs of ponderous sows, they run, past dogs soaking up sunshine like solar panels and the rugby field where ten-year-old boys shoot bamboo arrows in practice. They ram each other, tossing brother over brother, in and out of shadows of banana trees and wooden floorboards, narrowly avoiding stacks of new marota* draped against the neighbor’s house to dry. A moment, a breath to snuffle in cast-off shoes, then away! No need to rest, the piglets race, charging through the bamboo fence, wiggling as milk-rounded bellies, back legs get caught on sticks, then, push, kick, and through and they are past their mother rooting in the grass for sago crumbs, diving into mud patches which steam in the heat until the air is thick and tastes of moldering leaves. The piglets charge past, a valiant cavalry, until a motherly grunt, and the leader brakes, siblings tumbling over him like swept leaves, and their noses twitch in anticipation. 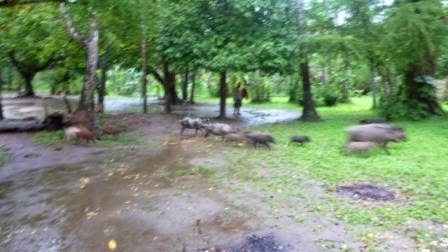 The sow trundles toward the road, her children falling into place, single file, each step all steadiness and decorum. Until the black-faced one stops, leaps, tail jerking, and they’re off again. Observations on the happiness of piglets were made on our three-week trip through Gulf Province, where I and my teammates assisted local communities in literacy, translation, song-recording, and other projects. Read more starting here. When suddenly, from behind the bushes, I leapt out in front of the rooster, waving my arms like a silent banshee as the bird sprang into the air, feathers flying. Around the water tank I chased him, past the sleeping cats and the squawking hens. 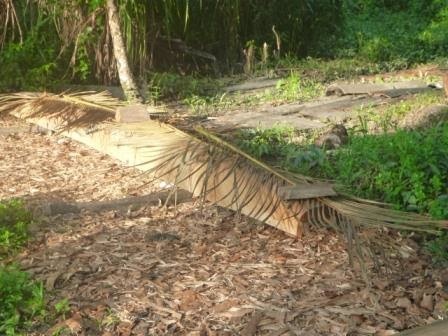 Over the logs, through the mud, we ran until the rooster was safely in the jungle at the back of his house and silence reigned over that part of the village. for hours so the recordings could be perfect. Throughout our three-week trip in Gulf Province, Rebekah recorded 34 translated worship songs in two different language groups. Some were translations of songs in English or Tok Pisin, but many were original compositions by these talented musicians. By recording songs and writing down transcriptions, we were not only able to preserve these marvelous snapshots of culture, but it was also a process of encouraging local musicians, validating their use of the local language, and--since Rebekah left burned CDs and SD cards behind--helping spread the message of God’s truth that was so eagerly sung by these choirs. Undisturbed, I might add, by nary a crowing rooster. Have you ever thought about the wonders of a Bucket? Buckets are the translator’s best friend. Buckets are not only versatile, but they are ant-proof, water-proof, rat-proof, cockroach-proof and have handles! Buckets in boats can mean the difference between a ruined milky slush and milk powder for your breakfast. They are the protectors of the Pillow, the Hand-Written Translation Data, and the Electronics from the inevitable downpours and crashing waves that are drawn toward cargo like moths to a flame. Yes, buckets are indeed treasured like gold, and it is a rare and precious gift when you are given a hand-me-down bucket. So, imagine our delight when our store advertised these magnificent 5 gallon buckets for sale! What elegance! What usefulness! And so, four of us on the team immediately each bought a bucket, thrilled with the possibilities for our trip. Until it came time to put the lid on. We pried and smashed and twisted and tore, but the lids wouldn’t seal (and then when one finally did, it wouldn’t come off). We emailed the store about the buckets, asking for help, and found out that even online reviewers were having trouble. Some suggested a rubber mallet. Another woman said as long as her husband was around to open and close it, it worked great. We emailed the store back. Do you sell rubber mallets...or husbands? Earlier this weekend, one of our guy friends came by to offer his assistance with “anything blokey” that we needed done around the house before we left for the village. We handed him a bucket. “We’ll give you cheesecake in exchange for you opening and closing those buckets,” we told him. Poor guy. At least he burned off all the cheesecake calories. But first, I had to get through the Village Prep (cue Lord of the Rings theme music). Dehydrated pineapple and polenta along with some creative granola! Of course, there’s about as much likelihood of that happening as for us to get a blizzard and for penguins to show up at my door. So instead (and especially when you have such an unexpectedly chaotic week like we’ve had) village prep often gets crammed into those last few precious days, and you feel a bit like Noah’s wife must have when she started to feel it sprinkle. What is involved in this undertaking, you ask? First, there’s trying to get the house ready for departure—and for us, this has included trying to order a new screen door from the US (which has become akin to the task of Frodo hiking up Mt. Doom...). We put up arc mesh over the plate glass window (and try not to fall off the ladder into the security plants all set to impale us with their toxic spines) and check the alarms (and make sure the neighbors have keys and codes) and leave instructions for our employees on where to find their tools and tea supplies (which were bought in bulk and stored in ant-proof, rat-proof, water-proof, raskol-proof containers). Success! The arc mesh is in place! We gather emergency numbers from everywhere and give our emergency numbers to everyone and log our travel plans with a dozen different offices and try to figure out why the sat phone isn’t working (or the radio). We spend hours and hours installing long swatches of chicken wire to try to fix the fence so the dogs won’t escape (since the electric fencer exploded in a cloud of sparks during the last major thunderstorm), attempt to figure out why the one dog is suddenly deciding to throw up, and try to find enough entrepreneurial children to walk and feed our critters. We hand off duties and keys up at the Pony Club, transferring medicines and giving last-minute advice (praying no more medical emergencies will arise). We send last minute prayer updates to supporters, try to write emails to preempt any possible problem that might occur over the next three weeks, attempt to put on an out-of-office reply that won’t spam the world, and try to make sure all bills are paid before we depart for a Land of No Internet. We buy extra credit for our digimodem, plan for power surges and breaking generators, and try to guesstimate how much fuel we might want to bring. We charge up all our batteries, dry out all our silica gel, load up on water safety gear (and try to decide if shark bags are really worth it? ), and bag up all the trash in the house to be picked up the following day. We leave the kitchen spotless (dishes left out could fall in an earthquake) and clean out the fridge (including the heap of garden produce brought the day before by a village friend), foisting leftover curry on friends and offering cabbages as housewarming gifts. We finish the last loads of laundry and pray it will all dry in time (mold, anyone?). Thank goodness it was nice and windy! And then it’s time to pack. Into the heap go everything from hammer and nails to tarps and headlamps, mosquito nets, medical books and solar panels, pens and notepaper and Bibles (in various languages) and the air mattress and sewing kit and enough medicines to treat an entire army. We ask ourselves, how much toilet paper will we use? How much money will we need? What kind of clothes are most appropriate (will sleeveless in this part of the country be scandalous?). There’s the mosquito repellant and sunscreen and backpack and hostess gifts and laundry powder and clothesline and pillow and knife and maps and enough IDs to let you into a whole host of countries. The Great Packing Pile is starting on my bed. And then, all it goes, into double and triple garbage bags and ziploc bags and dry bags and then again into backpacks and pelican case and buckets and boxes (not too big, since smaller boxes are more easily carried by hand or packed into the cargo bay of the Kodiaks) and taped up with the CLEAR packing tape, not the BROWN which is less waterproof, and it finally gets all lugged over the scale where we hope and pray it is still within the range of those few kilos of cargo that we booked months ago for the flight. Finally we pile it all by the front door and set our alarm so we’ll be ready to go when the aviation bus appears at our door at 5:30 am--complete with all our buckets. Don't forget to keep checking my blog for more stories about my adventures in Gulf Province! I look forward to talking with you all again in a few weeks. Old men, teeth stained black from years of chewing buai (betel nut), gesticulated wildly amid the shouting, as the young nursing mothers chimed in with a few choice comments, and children mumbled their opinions through mouthfuls of sugarcane. The young men pretending to be bored crowded in close, before one of them burst out in a passionate tirade. Over thirty people were shouting at once in Urama language, until the entire open air shelter shook under the vehemence. I glanced across the room at my teammates, and raised an eyebrow. Hanna gave me a small grin. I have no idea what they’re talking about either. While Hanna, Susie, Rebekah, and I were in Gulf Province for three weeks this past August, one of our goals was to conduct a limited-goals survey through several languages. We wanted to clarify several dialect boundaries and the extent of local language use within the village. Not only would this information be useful for directing Bible translation and literacy projects in the future, but surveys like this are valuable for language research, documentation, and encouraging communities to think critically about their own languages. Since 2010, survey in PNG has been utilizing specialized activities, which differ from the more confrontational and potentially invasive old survey techniques of questionnaires.These new, colourful, game-like activities create visual representations that invite discussion from all community members, often drawing huge crowds, while allowing the outside facilitators--me and my teammates-- to fade into the background. For example, in the “stoplight” activity described above, putting a village in the red circle indicates that their language is difficult for the community to understand. If a village name is placed in the green circle, then they speak exactly like the community doing the activity. A village name in the yellow circle means they speak differently from the community, but are still understandable. Outside the red circle is not understandable at all. Despite their great pride in their language and identity, many villages haven’t ever thought about it much, and discussions often lasted long after the yarn and pictures were packed away.